Two days left on our three day Super Spanish special. See details here. One way to have an alternative income is by tapping into future hot trends as a Super Thinking + Spanish teacher. Our Super Spanish teacher training has been closed as we worked with our 2014 trainees. Our newest teacher in Manta, Ecuador is now active and we just received this note from him. Super Thinking + Spanish teacher John Fischer with his first class in Manta. We are ready to train one more teacher. The next teacher we train may be able to start teaching early in 2015, but we will work with him or her through most of 2015. See why below and see how to learn special ways to teach increased intelligence and Spanish. Two points almost everyone agrees on about the future are… first, we need to be smarter to keep up with the faster pace of change… and second, the world’s economy has and will continue to globalize. This is one reason why we combined the science of Super Thinking with learning Spanish. Be smarter as the world turns faster. Super Thinking tactics in our courses help create new income opportunity and also can improve health. A Wall Street Journal article entitled “Ways to Inflate Your IQ” says: Many people think of IQ as a genetic trait, like brown eyes or short legs: You’re born with it and you’re stuck with it. Now, a growing body of research is showing that a person’s IQ can rise—and even fall—over the years. In the latest study, 33 British students were given IQ tests and brain scans at ages 12 to 16 and again about four years later by researchers at the Wellcome Trust Centre for Neuroimaging at University College London; 9% of the students showed a significant change of 15 points or more in IQ scores. On a scale where 90 to 110 is considered average, one student’s IQ rose 21 points to 128 from 107, lifting the student from the 68th percentile to the 97th compared with others the same age, says Cathy Price, professor of cognitive neuroscience at the center and co-author of the study, published last month in Nature. Swings in individual IQ scores are often written off as the product of measurement error or a test subject having a bad day. But MRIs in this study showed changes in gray matter in areas corresponding to fluctuations in the kids’ skills, Dr. Price says. There are practical steps people can take to see longer-term IQ changes. A 30-year study at the National Institute of Mental Health found that people whose work involves complex relationships, setting up elaborate systems or dealing with people or difficult problems, tend to perform better over time on cognitive tests. Test scores of people whose jobs are simple and require little thought actually tend to decline, according to the research, published in 1999 in Psychology and Aging. New tasks stimulate the brain most. When researchers at the University of Hamburg subjected 20 young adults to one month of intense training in juggling, they found an increase in the corresponding gray matter in the brain as early as seven days after the training began. Music lessons are linked to higher IQ throughout life, according to research by E. Glenn Schellenberg, a psychology professor at the University of Toronto at Mississauga. Six years’ lessons lifted children’s IQ scores an average 7.5 points. Super Thinking Tactics improve the brain in different ways… one being through the use of music. Second, our program teaches Spanish in three days… to prove the power of the technique. Spanish courses offer a strong income potential because globalization, particularly in the U.S., Canada, and Mexico (due to NAFTA and massive immigration) make it more important to be able to communicate with people from other countries. Increasingly, the second language U.S. citizens are choosing to learn is Spanish. Americans and Canadians are studying Spanish in record numbers. According to Businessweek, for example, more students studying for an MBA in today’s world are choosing to become trilingual by learning English, French, and Spanish. Moreover, two of the top ten MBA schools outside the U.S. are located in Spain. There are many other reasons to learn Spanish… about 500 million reasons… the global population who speak Spanish. About half of the people in the Western hemisphere speak Spanish, as many people as those who speak English. Within the USA, Spanish is the second language after English—by a wide margin. According to Wikipedia Spanish is the most commonly spoken language in the world after English, Chinese, and Hindustani. In the U.S., it is easier to get a job if you speak both Spanish and English. Having an alternative language can help you have an alternative income. Super Thinking teaching turns your income up and your education upside down! See below how our Spanish teachers earn income but are forbidden to speak Spanish when they teach. They must teach Spanish in English, but they can teach English to Spanish students as well… in English! The educational program Merri and I have developed uses a form of brain wave integration that opens enormous opportunity for expansion, understanding, peacefulness as well as greater wealth. We are sharing this in depth program with a select few through our new teacher program. Super Thinking uses frequency (in music and a number of other ways) to integrate brain waves so the process of absorbing, processing and recalling information is vastly accelerated. This brings forth the three C’s: Calm, Clarity and Coherence. Our Super Thinking programs are not gimmicks or tricks… just advanced education. Merri and I are explorers. Our business began 46 years ago (May 1968) and we continue to always look for what’s next… trying to stay on or ahead of the leading edge. This process helped us create the totally unique system we use that incorporates numerous tactics. The first tactic is to use Baroque music in the learning process. At least three best selling books, “Superlearning”, the “Mozart Effect” and “Superlearning 2000″ have revealed insights about how to learn and think more powerfully based on systems drawn from the Bulgarian educational master, Dr. Georgi Lozanov. This one tactic alone is so powerful that Small Business Innovation Research… an official site of the US government granted over $100,000 for the specific purpose they said was: to provide a method to remove barriers which hinder or prevent the employment of blind persons. An innovative method call the Lozanov learning system is proposed to help train blind persons to become computer programers and operators of automated equipment. Merri was among just a few who learned directly from Dr. Lozanov and is licensed in these techniques. Merri has enhanced this system with numerous other tactics. One is to make slight alterations in nutrition. Altered nutrition can make anyone a person 25% smarter. These two tactics are just part of seven, easy to use learning techniques that help gain any skill, from computers to athletics to conversational languages… in much less time than traditional learning techniques… often two-to-five times faster, in exciting and innovative ways…but most of all it is a system that is stress free and full of fun. The third tactic builds on the first two and uses 17 unique lessons to provide a vocabulary of over 4,000 words that brings Spanish fluency in a short time. A Livescience.com article entitled “CIA Seeks Anyone, Anyone Who Can Speak 2 Languages” shows that the key to learning was “the willingness to speak a language even though one was bad at it in the beginning”. In short those who learn the fastest and the best were those who applied trial and error to learning a language. The willingness to speak a new language even though not perfectly is the key to learning. Super Thinking + Spanish prepares you to communicate in just three days so you will sound quite good. The three day Spanish is very eloquent and allows you to apply trial and error after the course in three different ways… speaking words you read and hear in your lessons… creating Spanish sentences that get your point across mentally in a technique we call “detouring” and by creating sentences daily. When you memorize a sentence you quickly forget. When you create a sentence it is your forever! Shawn and Suzanne Bandick teach Super Thinking + Spanish at their condo in Mexico during the winter and in Canada during the summer. Our Super Learning System helps in innumerable walks of life. This is why the second year of our teaching program offers extra opportunity for you now. There is a huge and growing problem of accelerating change that requires accelerated learning. Learning Spanish is just a tiny part of the demand this problem creates. Expanded learning capacity is far more valuable than just being able to speak Spanish. So we are expanding the Super Learning focus in our business… shifting our mental process into overdrive. Super Thinking works by focusing on the learner first… the data second. This system “grows the learner” rather than just expands the information. The explosion of data we must all process every day means there is too much information to process already. Let’s view this learning in terms of plumbing to outline what “Growing the Learner” means. Now we are integrating this process into our Super Business Made EZ courses as well. This means we’ll provide this training in the US as well. The demand for Super Thinking far exceeds the numbers Merri and I can handle. Because we don’t have time to do more seminars, we added a teacher training program to replace ourselves. The teacher training program is described below. We are accepting a limited number of new teachers for 2015. The trainees can attend all the seminars we conduct in 2015. Training starts at the January 16-17-18, 2015 Super Spanish course. 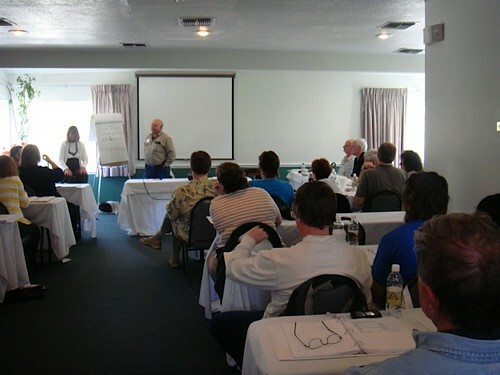 Trainees can learn how we market and conduct seminars at four courses (shown below). All four courses are included in the training fee. Super Spanish teachers are also members of our 2015 International Club and gain the following benefits. * You (and a guest of your choice) can attend all of the seminars we have already set for 2015 plus any others that we’ll conduct over the year ahead. * As a club member you receive FREE seven reports, email courses and workshops that would cost $1,265 if ordered separately. The first online course is “Tangled Web – How to Have Your Own Web Based Business”, normally sold at $299. The third is our online course “International Business Made EZ” sold at $229. You also receive fourth, the 50 minute video by our webmaster David Cross on “How to Get Your Web Business Started”. Your fifth course is the 50+ lesson course “How to Create your Own Website Using Sitesell” by Michelle Toole. We are proud that this course was written by a student of our courses showing how well the 43 years of knowledge that Merri and I have accumulated and put into these programs can help you start your own global micro business. You get our newest online course “Event – Full Business – How to have a Seminar and Tour Business” currently offered at $349. You receive our Multi Currency Portfolio service that is normally $79. You gain FREE attendance at the seminars below. Here are the courses we currently have scheduled in 2015. When you enroll, our computerized administrative system will send you a password that makes these courses easy to access at the Club website. Then you’ll receive an announcement each time we update our courses. When it comes to having a micro business in online publishing, seminars, courses and tours, there are few people with more experience than we have. Over 46 years we have organized, marketed and conducted thousands of tours for tens of thousands in dozens and dozens of countries (even behind the Iron Curtain). This course shares how we have done this… what we did right… what we did wrong… and what you can do better. 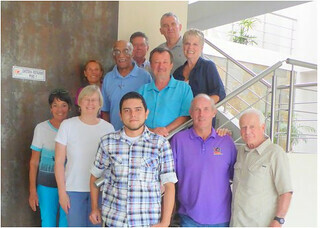 We have worked with our first group of teachers and after began adding one more teacher at a time. Our goal is for these teachers to work in their own ways and methods. Some teachers who were already life coaches have enrolled just to apply the techniques to their existing profession. Others have applied what they learned to charity teaching. Some of the new teachers have chosen to teach our Super Thinking Spanish course . These teachers have now taught courses in Ecuador, the Amazon, Uruguay, Mexico, Costa Rica, Seattle, St. Luis, Sarasota, Vancouver and Toronto. 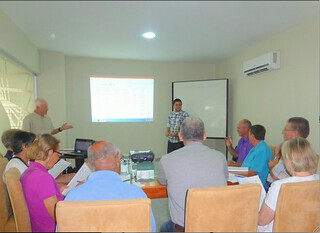 John Fisher teaching in Manta, Ecuador. We have been pleased with results. The first four teachers had 9 to 15 students but one in Vancouver had 25 with $6,737 in sales and one in Toronto is at 16 with $5,041. Not all the teachers have had this success… some are getting six and seven delegates in each course. One failed to get any signups and though we have received great comments about all the teachers’ ability to teach, the teachers with the highest income have been those who can get out and market the course. We have learned a lot about teaching teachers since we began the program and are even better at teaching teachers now. 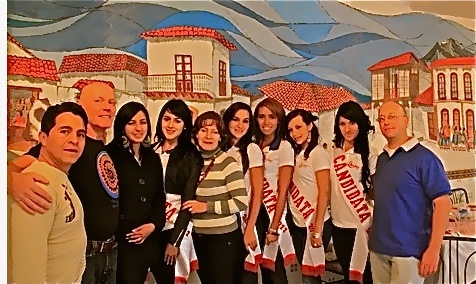 Rob Girga (right) and Glenn Sterling (2nd left) replaced Merri and me and taught Super Thinking plus Spanish in Cotacachi, Ecuador this year in the same hotel as a Miss Ecuador pageant. Here they met with the contestants. Teachers of our Spanish program do not have to speak Spanish during the course by the way. In fact even Merri and I prohibit ourselves from speaking Spanish when we teach. This is because the course must use a Super thinking teacher and a pronunciation coach who must be a native born Spanish speaker. Picking up pronunciation from an English born speaker is like recording a tape from a previous recording. Quality is lost! The teachers including Merri and me work in English and work with a pronunciation coach who does all the Spanish speaking. 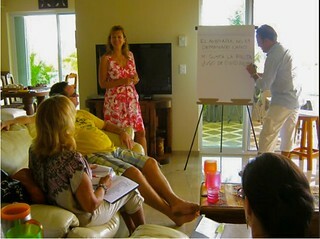 Merri teaching with our pronunciation coach, Don Childs. Others are teaching their own programs using the tactics they learned to help their own business. For example it is quite easy to reverse the process we use and teach Spanish speakers to communicate in English in just three days. The Super Thinking & Spanish program continues to evolve. We cannot guarantee who we will work with and who won’t. Becoming a trainee does NOT guarantee that you will become a teacher in our program. Our training teaches an effective way to teach languages but covers much more many… perhaps all fields of education. For example. We teach Super Thinking Business seminars that show how these mind expanding tactics can be applied to starting and running a business, to forex trading and investing. Athletes of all types… golfing being one common sport benefit. The Soviet Union… even though a third world country… excelled in the Olympics… as well as beating the USA into outer space… because it integrated FM teaching tactics as developed by Dr. Georgi Lozanov (one of Merri’s teachers) into its educational system. Our Super Thinking plan goes far beyond Lozanov and allows you to enhance whatever subject you wish to teach. Couples are priced as one. Merri and I have worked for 30 years as a couple. Our business would not exist without both of us… so a couple can attend for one fee. The fee for teachers is $2,900 Enroll here $2,900 .